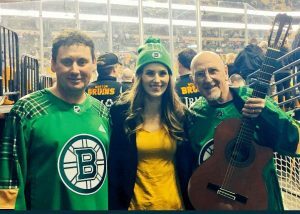 A MALIN man was given the honour of performing the American national anthem at a major league ice hockey game in Boston, recently. Declan Houton and guitarist Chuck Parish pictured with Kerry Collins, director of community relations with the Boston Bruins. Declan Houton, who is famed for fronting the recent Homes of Donegal fundraising campaign which raked in tens of thousands of dollars for those affected by flooding here in Inishowen last August, was asked to sing at the National Hockey League clash between the Boston Bruins and the Detroit Red Wings. He performed the ‘Star Spangled Banner’ in front of more than 20,000 fans in the TD Boston Garden, and a television audience of millions. The singer, who plays in a band called Devri, is no stranger to performing in front of big crowds. But said he nearly lost his cool when he started singing the first line of the anthem – only to realise they had failed to turn on his mic. He said: “When I started singing I nearly had a minor heart attack because they didn’t turn on the mic, but after the first line it was switched on, and it all turned out okay. Donning a green Bruins shirt for the occasion, Declan said it was a real privilege to perform the American anthem. The Bruins win by 6-5, added to the celebrations. The 46-year-old Malin man, who has lived in the United States for the past 19 years, said Bruins were marking St Patrick’s Day and Irish Heritage month, and that he was invited to perform through contacts in the Boston police department’s pipe and drums band. While he said he’d jump at the chance to perform Amhran na bhFiann at Croke Park in Dublin this summer, Declan said he’d be more interested in seeing the Donegal footballers getting back there for the All-Ireland final!